We deliver smart, sustainable design that enhances lives. LGA STUDIOS is an award-winning architectural design firm specializing in custom, luxury, and production home design, commercial architecture, and sustainability. Our team, led by Larry Gilland, is dedicated to excellence in architecture, bringing imagination, innovation, and integrity to every project, and the highest level of service to every client. Our unified approach brings your vision to life. Located in the heart of Colorado Springs’s New South End, LGA Studios is a multi-talented group of individuals dedicated to great design and the humans that use it. Our clientele count on us to meet their needs for consultation, design ideas, customer education, documentation, timelines, and budget. With well over a century of collective experience, our team approach to home and commercial design combines creativity, inspiration, and collaboration in every project. It is this attention to detail and to getting every client’s vision right that has led to multiple Grand MAME and Parade of Homes awards, features in home and lifestyle magazines, and a business built through referrals and reputation. Dedicated and solution-driven, our experienced team has your project covered. Green design and energy efficiency are at the core of what we believe and how we design. Our team is filled with LEED Accredited Professionals, and we are dedicated to sustainable practices in our projects and in our own daily lives. With LEED-H experience and building science knowledge, we consult with our clients to help make the best decisions for each project, integrating smart materials and practices while adhering to budget and timelines. Our process always has and always will begin with a conversation and a sketch. It’s the way we get to know our clients, and how we determine what each project requires to go from dream to reality. Beyond this initial beginning of putting felt tip to sketch paper, LGA Studios embraces the newest technological advancements of our trade, designing ready for construction plans in CAD and Revit, and offering 3D digital modeling via BIM. Working with these tools allows for better budget tracking and accuracy in visualizing changes. With a broad portfolio of residential, commercial, and remodeling work, LGA Studios has tackled complex design challenges and welcomes projects from tiny houses to luxury homes; minor renovations to full-scale neighborhood developments. 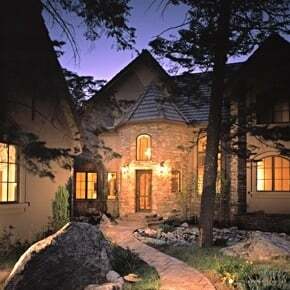 In addition to our own full range of design services, Larry Gilland is also a founding member of the Rocky Mountain Plan Company, offering custom-style house plans for purchase, and the Collaborative Design Group, a multi-disciplinary team of professionals capable of taking on large community contracts.